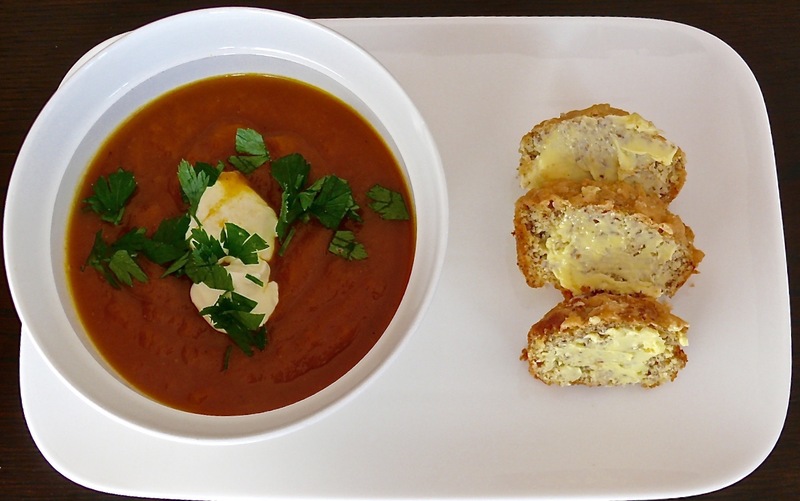 Soup and rolls – no grains, no gluten, low carb, healthy fat and lots of lovely veggies. Perfect for lunch, especially this weekend in Auckland with the temperature dipping to -1C. But first up I must admit to two things! The soup is just a different version of my other post. But, to be fair I have added a leek and ginger and changed the stock. So I say it’s a new recipe! And the cheese rolls; well no credit to me for the original recipe, but to the awesome folks from What the Fat (incidentally, this is a book you must buy, their Rocky Road Slice is to die for!). I have changed out the Psyllium Husks – for Chia Seeds and divided the mix into muffin pans then topped with a coating of cheese. Anyway this is what it looks like on a fancy plate. So let’s just get going. Coat pumpkin with your prefered roasting oil or fat. Let the pumpkin cool enough to handle then remove the skins. In a large saucepan heat the butter. Add the leeks and ginger and cook gently until soft but not brown. Add the Stock/Broth and bayleaves and salt and simmer for 15 minutes or until all the vegetables are soft and mushy. Remove the bay leaves and carefully blend in a food processor in batches. Alternatively, use a stick blender – take care with the hot liquid. Return to a clean pan and keep warm until you are ready to serve. Pour into bowls, add a dollop of sour cream, sprinkle with chopped parsley and a grind of pepper. Serve with buttered Cheesy Rolls. Add wet ingredients to the dry ingredients and mix until smooth. Leave the mix to thicken, around 10 minutes. Has anyone tried a successful egg replacement for the cheesy buns?